Ground beef and ground venison sloppy joes, combined with yellow squash and purple peppers from the farm share, with a kick from Korean hot red pepper paste. I've bumped the recipe that was scheduled to appear today at the request of my spouse. He told his coworkers I'd have the recipe from last week's sloppy joes luncheon up on the blog, and who am I to refuse him? [Don't answer that one.] It was ugly food, though, and I'm always happy to bump ugly food to a later date in hopes I can remake it and get better photos. The clever subtitle is also courtesy of my spouse [wish he also edited the photos--it's hard]. Since half of the meat in this recipe came from a cow named Butch and the other half from a deer skillfully obtained by his colleague . . . . the spouse's colleague not the cow's . . . it seemed an appropriate title. Adding some of the fresh vegetables from our Community Supported Agriculture (CSA) farm share is just bonus. Flavorful bonus. 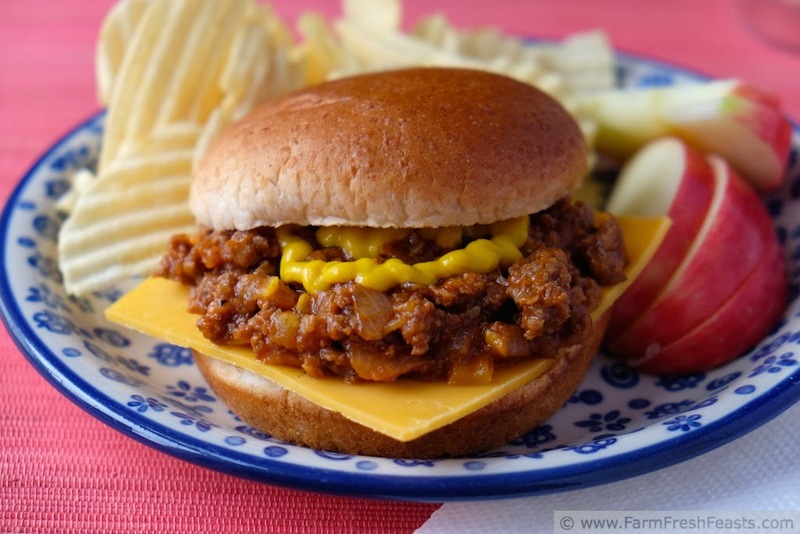 The basis for my recipe today is Pioneer Woman's Sloppy Joe Recipe. As in my Very Veggie Sloppy Joes for a Crowd I jumped right off in a "use ALL the vegetables" direction. Since I added ground venison, however, I didn't want to get too wild with the seasonings--ketchup and mustard is pretty tame I think. However, instead of all the chili powder and hot sauce I used some gochujang (Korean hot red pepper paste). Once opened, it keeps for a while in the fridge--I've included a photo of it so you know what to look for in the Asian section of the grocery store or an Asian market or here [Amazon Affiliate link] . I tend to throw leftovers at the family for weekend lunches because I usually fix a big breakfast, and my brain is percolating something good for dinner. Such a pain when they want to be fed again in the middle of the day, you know? Before taking the Joes to work for the luncheon, though, my spouse saved out just enough for the 4 of us. 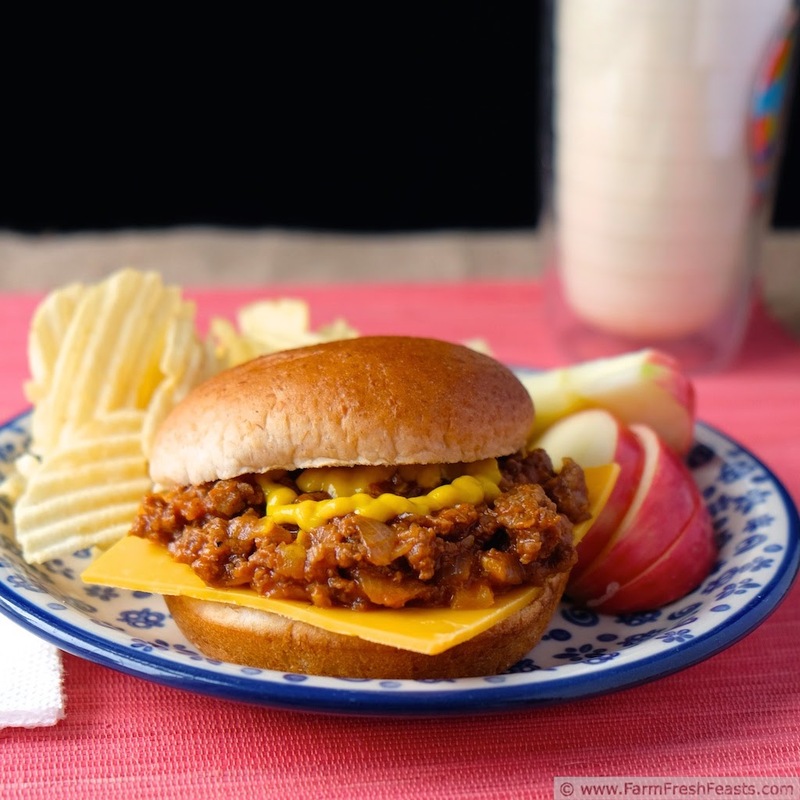 I was delighted to realize we could have one of my childhood comfort foods: sloppy joes on a bun with a slice of cheese and mustard, potato chips, apple slices, and milk. Perfection for a Saturday afternoon lunch. If you're lucky enough to get some venison, please try this recipe. I'll even share my gochujang, since I don't foresee sticking it into waffles or anything . . . though a pizza is in the creative ideas stage, and it's been delicious in grilled recipes and with bok choy. Want other recipes for ground beef? Here's a round up of 106 of them. Want other recipes using yellow squash? Look here. Need other ideas for bell peppers--any color? Try this collection. No venison in this photo--I used my package for the joes, and never intended to blog about it. No water in it either. 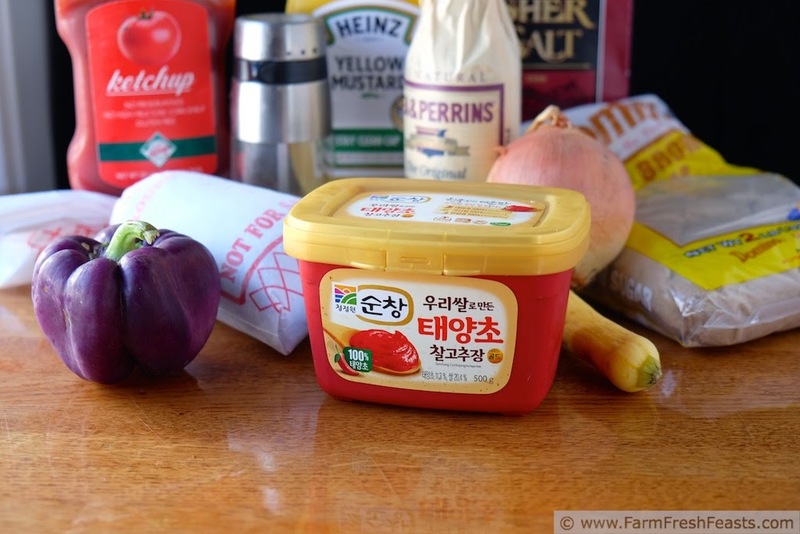 In the commissary, Gochujang is written in English, and the brand name and tub size are identical. To serve: more mustard, sliced cheddar cheese, buns or rice. Brown ground beef and venison in a large skillet over medium high heat. Drain. Add vegetables and sauté for 5 minutes until softened. Dump the rest of the ingredients on top of the meat and vegetables, stir to combine, cover, and simmer for 20 minutes. Remove cover and taste--do you need to add more salt or pepper? Serve on a bun with cheese and mustard (my favorite way), or over rice, or however you like. This reheats really well in the slow cooker, stove top, microwave or oven. 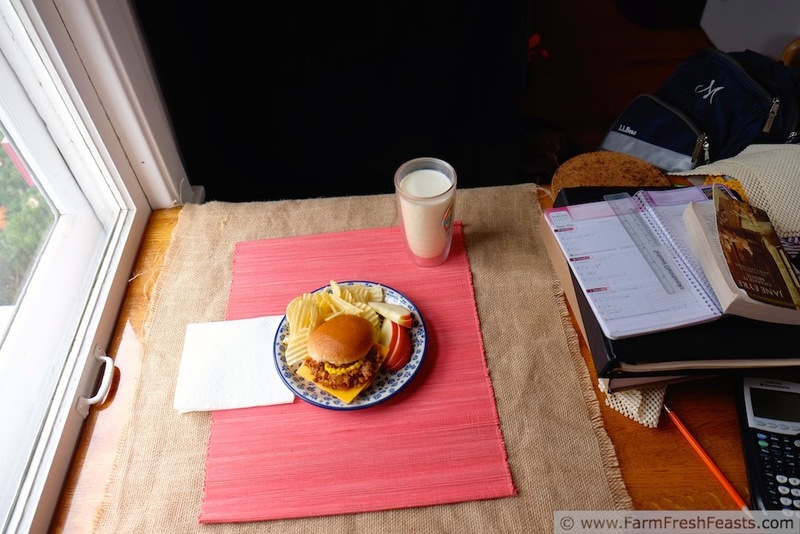 Behind the scenes--shoving my girl's homework out of the way to grab a pic of lunch. Jane Eyre doesn't mind. Thanks for the feature--I appreciate it! It is a pain to make an entirely different meal in the middle of the day. Which is why I opted to finish off the last of the potato chips instead of actually cook something. It was a good decision just like these sloppy joes. Love the spouses subtitles by the way. Yum, potato chips. Best part of a lunch sometimes. Okay, I loved reading this today, as I have to decide on a #SundaySupper meal to make for a theme involving game or wild animals, and one of the recipes I'm debating making is a venison sloppy joe! Or maybe a duck goulash. Like I said, I can't decide. But you may be tipping me in the sloppy joe direction! Do you have both duck and venison? I often think that my meal choices are governed by what's in the fridge/freezer and it would be . . . well, terrifying actually, to have the whole of a grocery store to pick from. Too many options for me! Good luck! Yum! This looks like a good recipe for sloppy joes. I always just use Manwich but I've been putting mine on pretzel buns. I'll try this recipe with my venison and pretzel buns. Thank you...pinned! Pretzel buns is a great idea! I'd not seen them until we moved to Ohio, then with kids in braces I sorta forgot about them. Thank you for bringing them back into my consciousness. I'll try that, too. 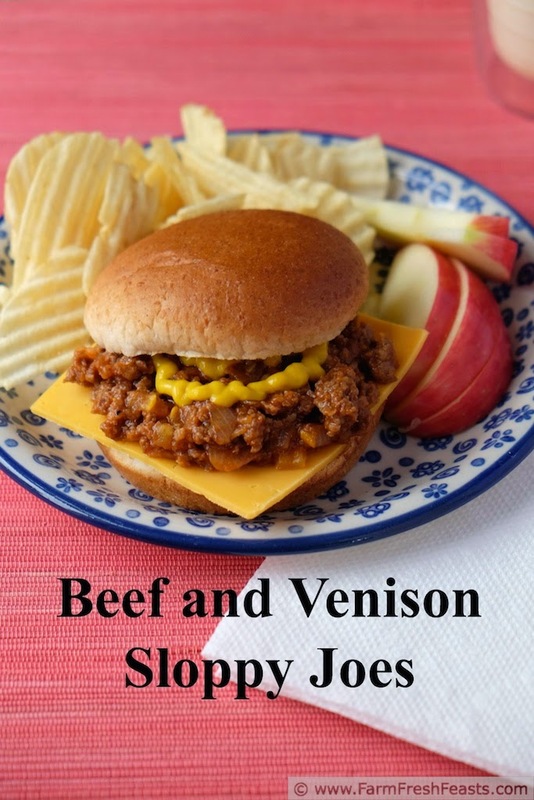 I love sloppy Joe's and I too always eat them with potato chips. Now you have me hungry. I am so glad I made you hungry--this photo does that to me, too! My daughter comes home for lunch and this was her plate. I'm always ready to dive right in.